A knock on the door brings you awake to another day in the foothills of the Sierra Madre Mountains. The smiling face of Ramon as he hands you a cup of hot coffee is your cue that breakfast is just 30 minutes away. Then, it's time to go fishing. Bass fishing was what we'd come to do, but you just can't talk about an Anglers Inn International trip to Mexico without mentioning the food and service. Both were unmatched by any outfitter we've ever heard of. Honey Hole family member and good friend Robin Crow who made the trip with us at the end of January said it best. "I couldn't have been treated more like a king if I'd actually been born into royalty." Our first meal after arriving at the lodge on the shores of El Salto had Robin and Dr. Craig Waldrop, another good friend and guest on this trip, raving about the quality of the food. Honey Hole TV producer Kent Dakour, Katie Watson who was kind enough to fly s down in her, company plane and myself just grinned at each other. We knew from past experience that we'd hear the same comments again, not once, but at every meal served during our trip. Each meal served in the lodge dining room is different. There's always more than you can eat and it's delicious. Just part of what makes this a very special trip is the food and service. The courteous staff at the lodge is headed by Jose', who's been with owner Billy Chapman, Jr. for 15 years. Every member of the staff goes out of their way make your stay a pleasant one. El Salto is one of the older lakes on Mexico's west coast ad is still cranking out quality bass. 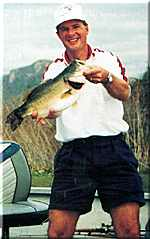 Our group had numerous six- and eight- pound bass topped off by a heavy nine caught by Robin the first morning out. During the three days we spent at the lodge, other guests there caught two 11's, two 12's and several 10-pounders. The majority of them came on crankbaits, but most of the heavier fish were caught on top with Storm Chug Bugs. Give that some thought! 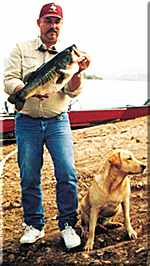 Few small bass were landed on this trip, which at first seemed unusual because El Salto has been known as a lake where you can catch over 100 bass per day. We later discovered literally millions of fry around and under floating mats of hyacinth. That's when we determined the smaller bass were homing in on easy meals. Actually it worked out better for us. Although we had fewer bites, the quality more than made up for it. As you would expect with catching double-digit fish on topwaters, most of those came extremely early or late in shallow water around points near arroyos. Mid-morning and mid- afternoon seemed to offer the best on crankbaits. Fat Free Shads and DD 22's both worked equally as well on underwater humps and islands around timber in 12 to 14 feet of water. This caused a lot of lost fish. Seven hard-pulling, drag-singing, don't know how big they were bites happened to me in just one morning. In spite of that, I caught two good eights and three heavy sevens, but it still hurts to think about the ones that got away. Very few fish were caught on soft plastics while we were there, but that will change with the seasons. The best advice we can give you is to listen to your guide. Like any professional who's on the water regularly, they know what the fish are doing and when. Sometimes you may out-guess them, but it won't be often. Keep in mind that Anglers Inn also offers light tackle and billfish trips at the coastal town of Mazatlan, which is known worldwide as the "City of Sads." Marlin, swordfish, dorado and tuna along with sailfish are caught fairly close in at this beautiful location. Anglers Inn is headquartered at Mazatlan, which is where you fly into initially. The lake lodge is less than an hour-and-a-half drive north. All licenses, lodging, meals, open bar, boats and guides are furnished for one affordable price $1,295 for four nights and three days of fishing. Tips and airfare are you only other expenses. Chapman's staff can point you in the right direction for souvenir shopping while in Mazatlan. You'll be impressed with the shops, cleanliness of the area, and the welcome you'll receive from the locals in town. You'll also be amazed at how many Canadians vacation on this strip of beach, also known as the Mexican Riviera. The trip is just a couple of hours by plane for most Texans and it's one you'll not soon forget. The cost is no more expensive than meals, lodging, travel expenses and a guide on some of our own lakes. It's truly worth making the trip.